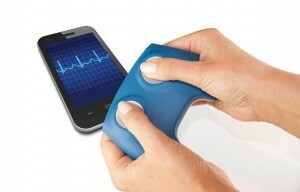 Plessey will be launching a hand held, ECG monitor at this year’s Electronica Show. Aimed at the home health market, the imPulse™ will allow the routine, quick and accurate recording of ECG signal outside of the medical environment and without the need for conductive gel or skin preparation. This compact, hand-held device detects an ECG signal when the user’s two thumbs are placed on the two sensor pads using two Plessey PS25201 sensors to recover the ECG signals. It measures the left and right signals and transmits the data via a Bluetooth link to a Smartphone or Tablet where custom software can then display the ECG trace and perform some simple analysis of heart rate. Using the latest generation of the EPIC sensor, which typically uses only 1.5mA during the short (15 seconds) period needed for ECG sensing, the imPulse has a very long battery life of several months before recharging. The EPIC sensor, which requires no physical or resistive contact to make measurements, will enable innovative new products to be made such as medical scanners that are simply held close to a patient’s chest to obtain a detailed ECG reading or safety and security devices that can ‘see’ through walls. The sensor can be integrated on a chip with other features such as data converters, digital signal processing and wireless communications capability. The technology works at normal room temperatures and functions as an ultra-high, input impedance sensor that acts as a highly stable, extremely sensitive, contactless digital voltmeter to measure tiny changes in the electric field down to milliVolts. Most places on Earth have a vertical electric field of about 100 Volts per metre. The human body is mostly water and this interacts with the electric field. EPIC technology is so sensitive that it can detect these changes at a distance and even through a solid wall.